Released by Starkey on August 26, 2018 the Starkey Livio AI 2400 falls under Starkey`s premium technology level within the Livio AI family. Hearing aid companies release new products all the time, but truly groundbreaking innovations like Starkey Livio AI come only once in a while. Livio AI blurs the boundaries between hearing aids, wearable health technology, and multifunction consumer audio devices known as hearables. Starkey calls the new Livio AI the world's first Healthable — a multi-purpose device that redefines what a hearing aid can do. The Starkey Livio AI 2400 hearing aid has 24 channels and 4 customizable programs, and that gives it the flexibility to digitally process sound in a way that sounds natural, and can also be adapted to the particular listening environment of the wearer. The Livio AI 2400 is powered by a size 13 battery which will need to be changed every 7-10 days, or a size 312 battery which will need to changed weekly. With a maximum potential gain of 70 SPL, the Livio AI 2400 is suitable for individuals with mild to severe hearing loss. Available in either a discreet RIC (receiver in canal) form factor, or a traditional BTE (behind the ear) style, the Livio AI 2400 has a suitable model for anyone not wanting to wear an in-the-ear hearing aid. This hearing aid is available in 7 color choices as shown below. If you have questions about the Livio AI 2400 that you don`t find answered on this page, or are looking for specs on this device, you might want to check out the downloadable documents (below), visit Starkey`s website, or feel free to give us a call at 800-731-6794. How does this hearing aid differ from all other hearing aids on the market? Starkey Livio AI are the first hearing aids with integrated sensors and artificial intelligence. Information from the sensors is transmitted wirelessly to the Thrive Hearing Control app, allowing innovative ways to track and monitor your health. For example, three-dimensional motion sensors make it possible for the hearing aids to track your physical activity or alert a family member in the event of a fall. Can I use the Thrive app with Apple Watch? Yes. The Thrive app for Apple Watch allows you to control volume, change the listening program and mute your hearing aids right from your wrist. In order to stream audio and phone calls to your Livio AI hearing aids, you will need to use the Thrive App on your smartphone as these functions are not supported by the app for Apple Watch. Can I track my hearing and physical activity without carrying a smartphone all the time? Yes. The hearing aids have integrated motion sensors, so they can track movement, even when you are not carrying a smartphone. You'll need the app to view your Body Score, Brain Score and Thrive Wellness Score, but not to track activity. 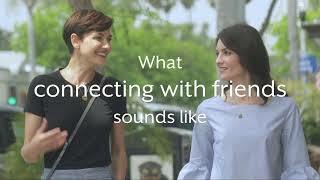 The app will synchronize with your hearing aids when they reconnect to your smartphone. Is the sound quality of this AI version different than the non-AI version? No. The features of the AI version, such as language translation and fitness monitoring, are additional features beyond the standard non-AI model, but the sound quality of both models is the same. Introducing Livio™ AI from Starkey, the world’s first hearing aid that tracks brain and body health using integrated sensors and artificial intelligence. Livio™ AI is our best sounding, best performing device ever.